“How are her people ever going to find her? We know there are a lot of new entrepreneurs out there thinking the same thing as Vicki. So, how do you keep going while you’re kind of talking to nobody? We finish with a Bizdom style blend of mindset advice for when you’re feeling bummed about your small or non-existent audience and three practical strategies that anyone can use to get more people in front of their content. We loved answering Vicki’s question and just know that you’ll take away something for your own journey. Fizzle: get a month for free! Submit your own question to be answered in a future Bizdom episoide! This week I'm so excited to welcome my friend and coaching student, Megan Seeley -- The Goal Designer! Megan is an anti-productivity coach for moms. She challenges them to live a life of radical non-guilt, and teaches them to strategically carve out time for themselves. Megan is very much in the middle of her own Courage story, and she shares her entrepreneurial journey vulnerably. After re-arranging her entire life to be a stay at home mom only to realize it wasn't for her, Megan knew she had to discover her purpose. In the Clarity part of the episode, Megan shares her 3 tips for combining traditional paper planners with the 15 Minute Planner Method. 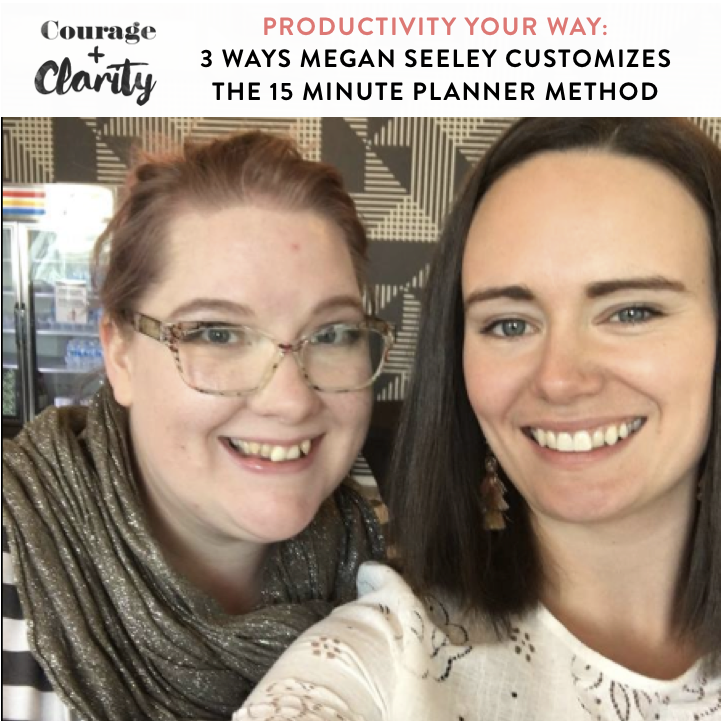 If you love the 15 Minute Planner Method but are seeking a way to customize it and truly make it your own, you'll love this episode with Megan! What if selling courses and products could be inspired by the communities you serve and actually feel good? In the final (for now!) episode of the Business Wisdom Series, our one and only Megan Hale asks Steph a question that entrepreneurs often wonder. When someone else’s business looks effortless and fun, is that the whole story or is there more to it than that? 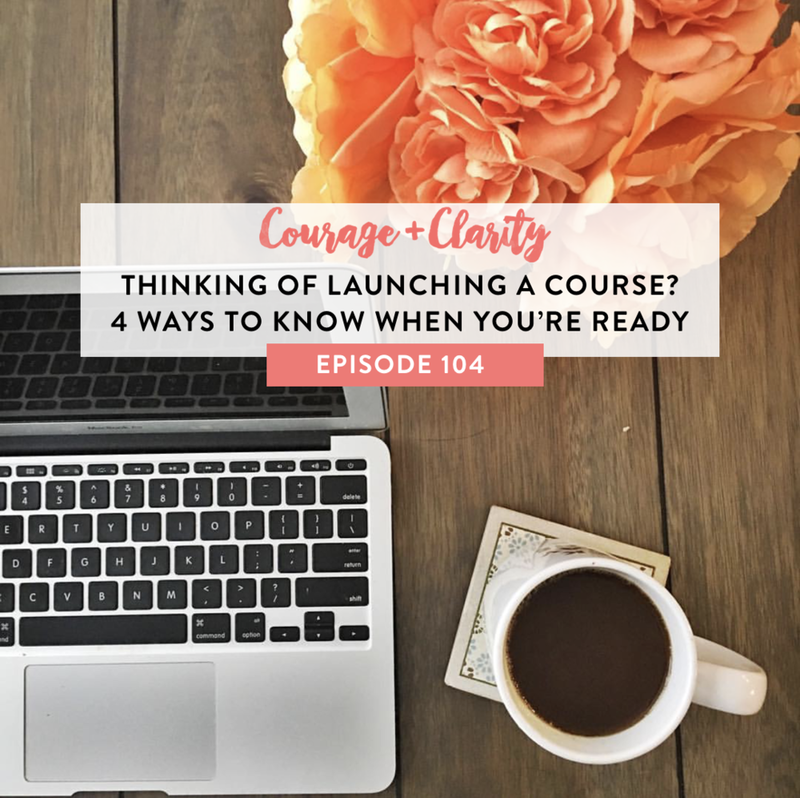 In this podcast you’ll get a behind the scenes glimpse at Steph’s successful pre-launch and how she follows her intuition to make decisions in her business that feel good and get results. You’ll also have proof that even the most successful business owners have to move past their own fears to get their best work out into the world. This conversation will have you thinking differently about the smallest interactions you have with your community and is full of Bizdom ah-ha moments! If I were in the audience how would I want to feel? What would I like to learn and how would I like to learn it? If I put my work out there, what’s the worst thing that can happen? Have you ever asked, "is this as good as it's gonna get in my business?" In this episode of the Business Wisdom Series, Steph & Megan dive deep into plateaus -- what they are, why they happen, why they're normal and how to move past them. In this episode of the Business Wisdom Series, Steph & Megan dive deep into plateaus -- what they are, why they happen, why they're normal and how to move past them. 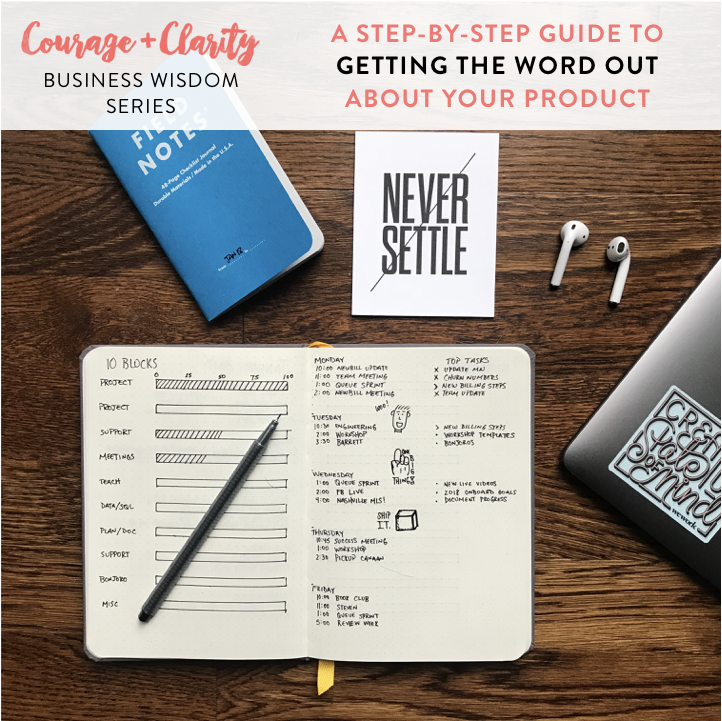 In the clarity part of the conversation, we give listener Beth some practical tips she can use when her business hits a plateau -- and this applies to all of us, beyond our businesses too! "What should I do when things feel stagnant? There is no growing going on. Is this just a season or is this as good as it gets?" "If you feel like you've hit a wall, open the door and walk through." - Price Pritchett, "You Squared"
Running your own business on your own terms is awesome and everything but ... what about balance? It's a question we get all the time, and if we're honest, it's something we're wrestling with all the time ourselves. 1. The balance between "what I really wanna be doing" and "what I need to do first"
5 Day Challenge: Plan Your Most Productive Week Ever - Sign up! Wild & Holy Radio - The "How" will follow the "Why"
If you want to create a strong push for getting the word out, where would you focus your energy? This week's question comes from Marianne and in order to answer it we're digging into the two pillars of business building: audience, and product. We're defining the "lie of productivity", examining the difference between working ON your business versus working IN your business, and sustainable vs. unsustainable growth. Megan's all about doubling down on the people she's already got, and Steph's instinct is to expand outward. Both strategies are necessary, so with our powers combined we're giving you a roadmap to building buzz and keeping the audience ball rolling while you're simultaneously building a product. This is a juicy, tactical tip conversation, and as listener Marianne warns, "Don't Bizdom & Drive -- you'll want to write everything down!" Plan Your Most Productive Week Ever - Free Challenge, July 23! In this episode of the Business Wisdom Series, Steph and Megan answer Patrick's question: Do I reduce my price to attract customers, or keep the price I set? We're dishing up a method to communicate the value of the customer transformation and how to set the prices in the first place. In the clarity part of the conversation, we've got tactical tips and advice for Patrick or anyone else struggling with pricing. Patrick's question: Should I reduce the price of my service to attract customers? Or should I stick to the price that I set and hope that sometimes they will understand the value that I'm offering? * Reach back out to those people that you've been talking to about your services and see if you can get some feedback on where they're at. * It is perfectly okay to play with your prices. There is an option to keep your prices where they are, not reduce them publicly. * If you are getting stuck on price, it is either too high for your market or your value is not being communicated well enough. * You need more experience and more information to really know which way to go. 1. What price do I need this offering to be to help me meet my bottomline? 2. How do I embody the value & how do I stand behind it? 3. How do I communicate value effectively? Ladies and gentlemen, a question Megan Hale & Steph Crowder have NEVER gotten before! Penny asks, "How important is it to figure out why I'm stuck? I know I'm stuck, and I know I want to get unstuck. How much time and energy do you spend finding out why you're stuck rather than just looking for ways to get unstuck?" In this Business Wisdom Series episode (#4! ), we're tearing into this whole "stuck" thing, teaching you to flip it, detach from it and not let it control you. And in the clarity part of the conversation, we're diving into practical tips and mantras to truly move past that stuck feeling. 1. Don't look away from the scary image. I want you to write down, "What is the worst case scenario?" Ah, the internet -- a vast place chock full of free information. You can teach yourself to do just about anything using the web, from running a business to learning a new language. What a time to be alive! But, is it just us or is the sheer amount of STUFF out there just ... overwhelming sometimes? If you've ever hit information overload when it comes to online business advice, you aren't alone. Today's listener question, the third one in the Business Wisdom Series, comes from listener Madeline. She wants to know: How the the heck do you figure out who to really listen to? In this episode, we're talking about trusting the advice of others and how it can help make your business grow. We're also dishing real actionable tips to help you gauge whether your BS meter is finally tuned, or if it's time to scale back the noise and listen to you. Whose advice and counsel should I trust and listen to in the age of information overwhelm, specifically when it comes to business? And when I find "my people" to listen to, how much of it do I apply? The importance of a personal definition of success and “enoughness"
"If you are listening to things and you don't find it actionable, find someone who's gonna give you the heart and the head." PrepDish - get 2 weeks free! So we've all heard about the importance of growing an audience and that sounds all well and good, but... how in the world do you get actual people to start paying attention to you when you're starting from scratch? Welcome to the second episode of our Business Wisdom Series, where my friend Megan Hale and I answer questions from amazing C&C listeners! In this episode, we're breaking down an excellent question we got from Karen: How do you get your FIRST 100 subscribers / followers / people other than your mom and boyfriend? We're talking about different ways you can engage and connect with people to help your business grow, and four big troubleshooting questions you can ask yourself if you're struggling to find some traction. What are the steps to take to attract the first 100 email subscribers without getting frustrated and overwhelmed? How do you start marketing on Instagram without begging for followers and likes? Fizzle - get 5 weeks free! Submit YOUR question for the Business Wisdom Series! It's Megan Hale! Megan is a dear friend of mine and fellow member of my beloved Mastermind Group. Plus, she's been on Courage & Clarity two times already! The conversations I have in private with Megan are so full of business breakthrough moments, she felt like the perfect person to bring on as a co-host as we lead up to Episode 100 of C&C. Today, our first question comes from Helen. You'll get to hear her lovely British accent when she asks the question in the episode! Listener's question - "What is that one thing that you would definitely do in building your business if you can go back and start again?" Steph's big tips: The value of an "apprentice role", Learning to take up space, and paying yourself! Prepdish - 2 weeks free! Yep, me too. And if you've ever felt yourself tripping over how to explain your work & your vision, especially to ideal customers, you'll love today's episode with business clarity coach, TEDx speaker and fellow podcaster, Adria DeCorte. PrepDish - get two weeks free! "What the heck should my brand look and feel like? What sets me apart? How do I show up in a sea of noise?" These are questions I hear a lot, and this week on the show Kaye Putnam is here to help us out in a major way. Kaye is a psychology-driven brand strategist for entrepreneurs. She helps business builders create drool-worthy brands that really underscore a core message. 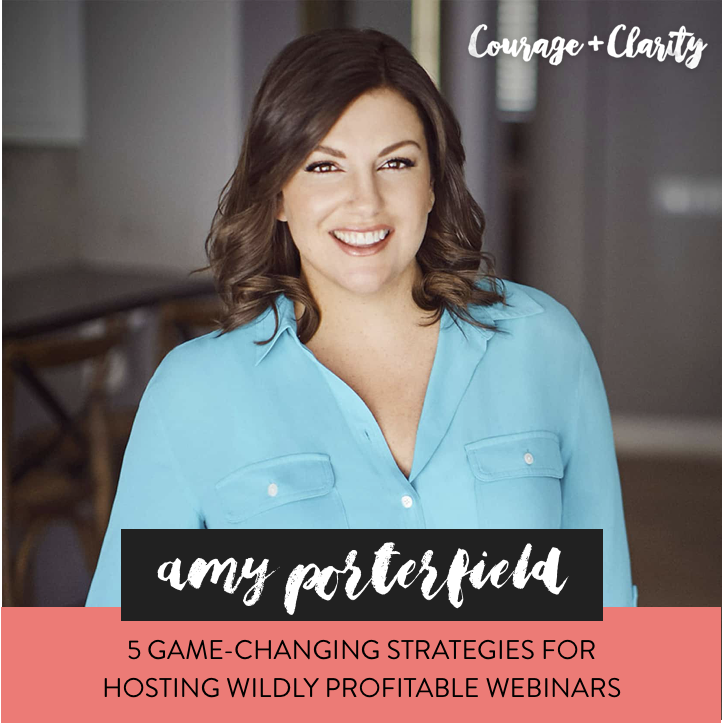 And bonus, she's got awesome free content on unlocking your brand advantage! 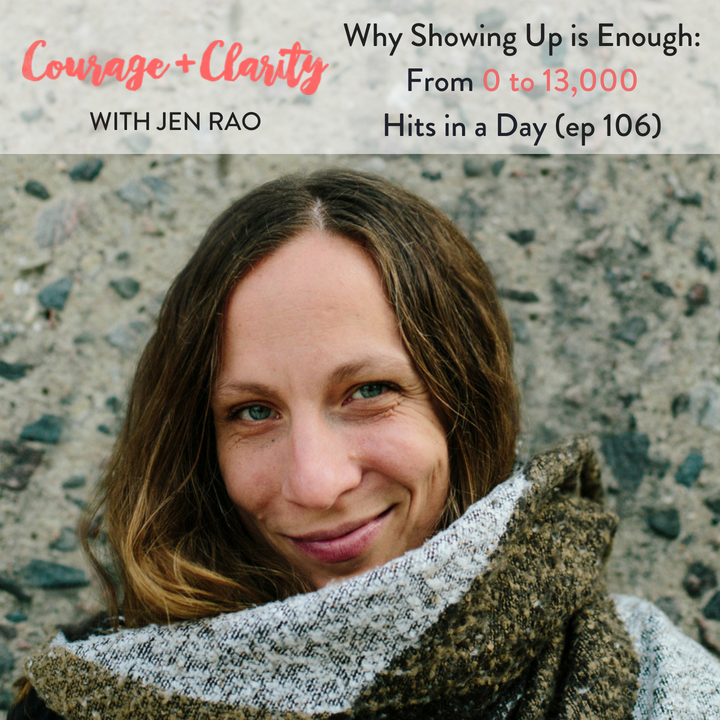 In the courage part of the episode, Kaye shares her awkward start to online business and how trying to be "like everyone else" got her nowhere fast. 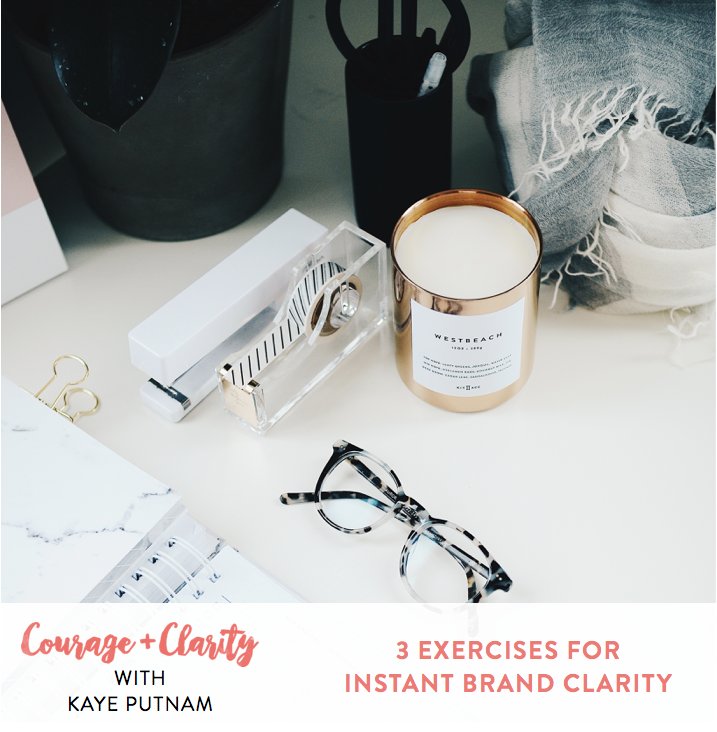 Then in the the clarity part, she shares three exercises that all of us can dive into to uncover brand clarity. We're talking about attracting ideal clients and the importance of repeling bad fit ones.